Home About Tiffany Video Tour Blog Publications Tiny Products Got A Question? HomeAbout TiffanyVideo TourBlogPublicationsTiny ProductsGot A Question? Tiny living with a minimalistic mindset. Meet Tiffany. She is designed after a 1920's craftsman style bungalow house. 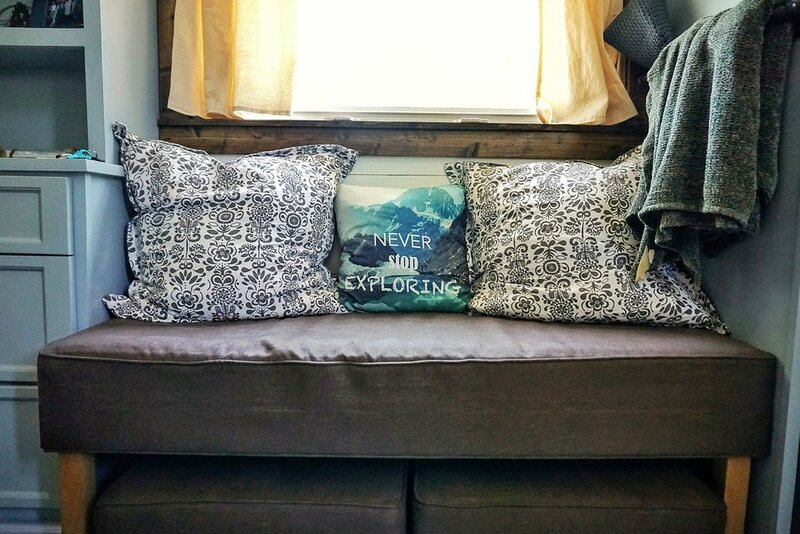 Built by Adam from A New Beganning Tiny Homes. Her custom stained glass windows and wall sconces help bring Louis Comfort Tiffany designs back from the 1920's and into the 270 sq. foot home. Tiffany sits tall and proud on an American made TumbleWeed 24 foot trailer, and although she doesn't like people asking, she is a slim 15,000 lbs. 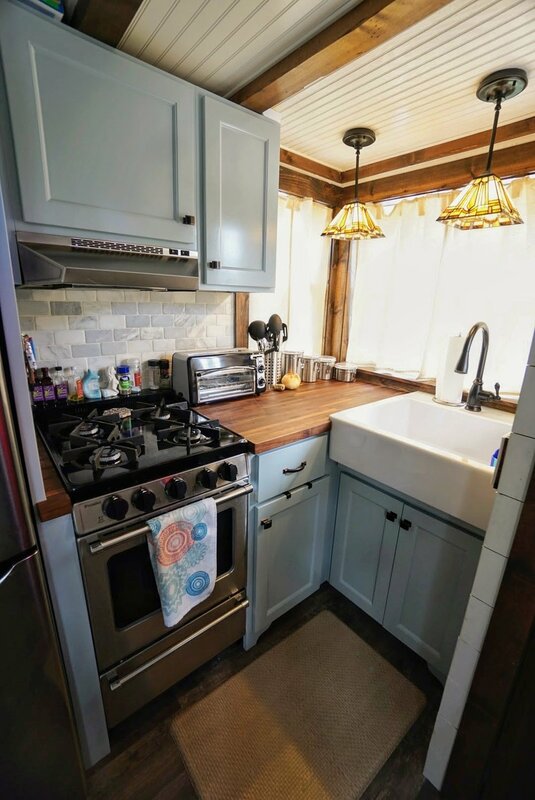 In the kitchen she is equipped with walnut butcher block counter tops, an oversized farm style sink, 10.3 cu f00t fridge, and a 20'' propane stove which makes cooking a painless task. We do find it hard sometimes not to look out the huge custom double hung Low Emissivity windows to see what is going on outside. The living room area is accented with a folding leaf table that is made from the same walnut butcher block counter tops though out our tiny space. As far as seating goes inside Tiffany, she has a cozy custom upholstered bench with matching foot stools that double as seating at our leaf table. When we want a little bit more space, the stool's card table legs fold in so they can be tucked under the bench and out of our way for some yoga or just to gaze up at the dark reclaimed woods and white walls that hold up the barrel ceiling. With just gazing on the inside of Tiffany you would never imagine how much storage she has hidden throughout. Tiffany space is well utilized . Whether it's the sliding drawers under each step of the stairs or the 12'' deep custom headboard behind the queen size bed in the master loft, Tiffany has a vast amount of storage to keep all of our tiny treasures. Speaking of treasures, one of Sam's favorite treasures in Tiffany is the custom cedar wood, removable, Japanese inspired soak tub. The tub is surrounded by 46''x 30''Amalfi tumbled subway marble tile and sits under a full range overhead shower head in case you do need to hop in and out for the next adventure. Ok, we get it, she's pretty. Well tribe, she's also smart! Encompassed within Tiffany is a Lutron Caseta wireless system. This means we are able to literally talk to our Amazon Alexa and Nest products in order to control features throughout the home which we will be discussing in our blog. Not only is she esthetically pleasing and smart, but she is built like a tank and wears a NOAH Certification. This allows Sam and I to have the peace of mind that this incorporates nationally recognized safety, construction, & energy efficiency standards currently used by the Home Building & RV industries. Inspections are also video documented and archived for whenever we need them. Okay, I am done for now. As you can imagine there's just so much to talk about. Between Tiffany and tiny home living, I could just talk forever. 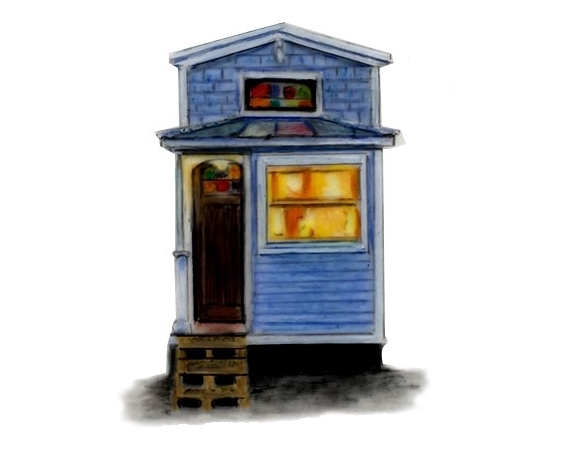 Good news is that we have a blog section that we will go in much more detail on not only Tiffany, but also tiny products to help make use of the space and what is it like living in a tiny home like this beauty. So make sure to sign up for our newsletters or follow us on social media below in order to stay tuned on this life adventure! Want a video tour of our home?